I lead a core team of 8 artists on this project, with a producer and additional art, character, code, video and audio resource coming onboard as necessary. After joining the project solo in early 2009, I started to plan what I wanted MotorStorm’s presence in Home to be, alongside my remaining Pacific Rift responsibilities. 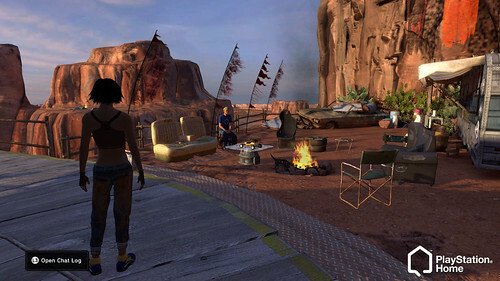 PlayStation Home’s a bit of an odd one and doesn’t sound the most appealing of assignments, but it had some major plus points. First up, someone had to do it and I’d rather mess it up myself than see someone else rubbish our game, plus I wanted to build on the festival work I’d done on the first two titles. 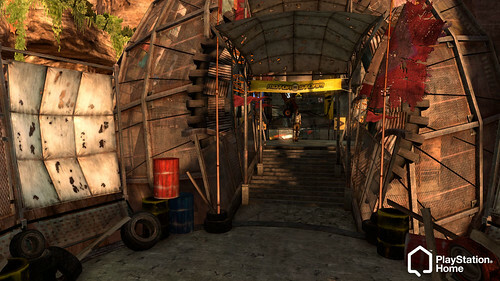 Whatever your opinion of Home, our job was to try to create a fitting visual experience that tied in with MotorStorm and built on the game’s idea of a festival, for both current and future MotorStormers. After using an early beta HDK, I realised it would be a challenge to deliver the level of quality I wanted, honour the visuals and aesthetics of the game and keep my team happy, who would all be moving away from more traditional dev projects like Wipeout and MotorStorm. The tools constantly improved and and we had a good relationship with the Home crew in London, a very skilled team, time away from the pressures of front-line development and some creative freedom and ambitious plans for the spaces. The MotorStorm Carrier – the ‘Game Space’, basically a big industrial rave on the aircraft carrier HQ, and amidst ‘The Raft’, both of which I’d shuffled into into MSPR’s festival movies. It contained a multi-level hangar, interactive (and very accurate) decks, a chill-out area with functional ‘Lunatic Launcher’ arcade machines, animated lasers/smoke machine/lights, a treasure hunt with various Home clothing rewards, two video screens and a TV wall in front of the decks, complete with random microwave/fish tank/oscilloscope. There was also an exterior moonlit view of the Island, complete with sprawling ad-hoc marina and a smoking volcano.